“I love amigurumi because the possibilities are endless,” says Sabrina. 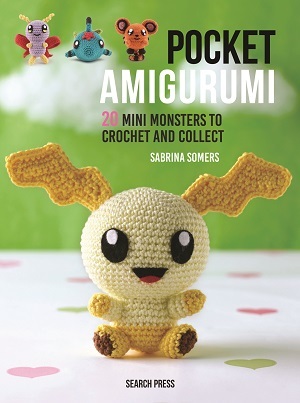 Amigurumi is the art of knitting or crocheting small, stuffed yarn creatures. 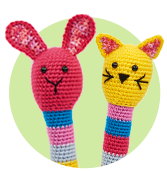 The word comes from the Japanese words ‘ami’, meaning crocheted or knitted, and ‘nuigurumi’, meaning stuffed doll. “Before I started crafting I didn’t know that amigurumi even existed and I can imagine this applies to many people,” she adds. There’s been a surge in the craft over the last few years and Sabrina believes the internet has played a huge part in that. “Social media has a big influence in the popularity of amigurumi,” she explains. “People share their projects online which allows new audiences to learn all about it.” You only have to scroll through Instagram and your feed will be awash with adorable toys that are certain to inspire. “Every new project is a challenge for me to make it as cute as I can – if I could give one piece of advice it would be the bigger the head, the cuter the creation,” reveals Sabrina. She explains that the most important part of your finished toy is the face and that you need to remember not to rush it too much. We admit that we’re sometimes guilty of adding those final touches too quickly! This is the question we’re sure is on everyone’s lips: how do I take my favourite hobby and write an exciting new craft book? “From the moment I designed my own project I dreamt of making a book but I never had the courage to approach a publisher,” remembers Sabrina. “One day I got an email from Search Press asking if I was interested in making a book with them – I was so happy with the chance and I couldn’t wait to start making the characters.” All of the projects in Sabrina’s book use just one hook size and 4-ply yarn so you can easily whip up a whole team of beasts. 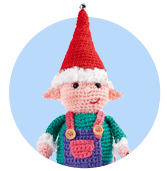 These teeny toys are great collectables and suitable for crafters of all abilities too. “For beginners I would recommend Nymphea the floral monster or Stegoroc the dinosaur because they don’t require many different stitches.” If you’re searching for more of a challenge, Sabrina suggests Cinzouri, the hedgehog-inspired monster. All of the 20 loveable animals are super fun to craft and you’ll have them whipped up in no time. So what can we expect next from Sabrina? “At the moment I’m working on a pattern for a book from Amigurumipatterns.net,” she reveals. “I hope I get the chance to make many books over the next few years.” We can’t wait to craft more of Sabrina’s inventive designs. Check out our amigurumi creations on Instagram! Sabrina Somers started her crochet journey in Amsterdam back in 2014 after she spotted amigurumi projects online and immediately fell in love with them. “My boyfriend bought me Zoomigurumi so I could learn to make them myself – my first toy didn’t even come close to the original from the book, but I was really proud that I’d made one,” Sabrina explains. Little did she know that this would encourage her to start designing her own patterns and go on to publish a successful book of her own.